The mere mention of the name Ewa Podles draws awed whispers from the opera cognoscenti. 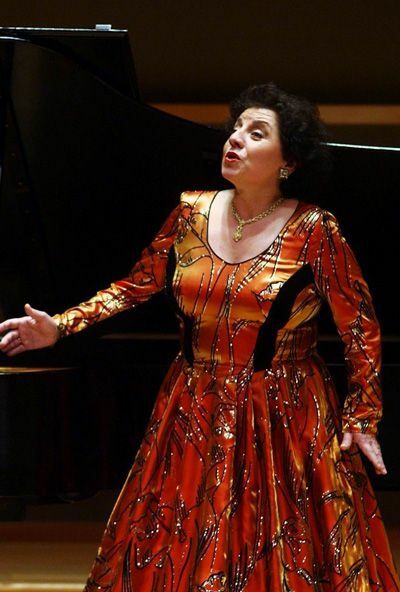 The famed Polish contralto, long revered for her unique voice and raw dramatic powers, is a living legend. She journeys to San Diego Opera this month to help open their season in Donizetti’s The Daughter of the Regiment. While taking a break from rehearsals, she was kind enough to share some thoughts on this production, her fascinating career, and what the future holds for her. ConcertoNet: Your repertoire of course is incredibly diverse, and the role you are singing here in San Diego, the Marquise de Birkenfeld, you have actually sung before, correct? Ewa Podles: Yes, yes. Twice. In La Scala and in Houston, the same production in Houston. CN: Do you find the role particularly comfortable in your voice? EP: Yes, absolutely. Listen, it’s nothing to sing [laughter], because this role of the Marquise de Birkenfeld is generally considered a secondary role. Of course, I don’t agree with this opinion. I must confess that I would never accept a secondary role if it were not important for the drama. It’s not too easy to play her because I have to show many faces of her personality. She’s a rather complicated person, you know. She’s an aristocrat, always impressed by wealth and titles, money, fortune. [She’s a] woman who likes men. It’s very funny, but the only one she really loved was killed during the war. I think she was not happy in her life. She had the courage to connect her life with Captain Robert, a simple, ordinary soldier, but she had no courage to raise her daughter. I think this is her big complex. When she finally finds Marie, she is ashamed to reveal that she’s her mother. She pretends to be her aunt. Finally she’s very intelligent and very honest. In the most decisive moment for Marie’s life, she shows her immense sensibility, warmth, devoted heart and she makes the only possible, correct decision, finally, without fear of the reaction of the aristocrat society which she had before, years and years ago when she decided to hide Marie. CN: While Daughter of the Regiment is considered a comic opera, her role is not the comic relief. She is the dramatic impetus for everything that happens. EP: Yes, absolutely. Because, for me, she’s the most important character of this opera. Of course, she has much less to sing compared to Tonio and Marie, but she opens and closes the story. Without her, the intrigue wouldn’t exist. The entire story is driven by what she has made in her youth, what she’s doing right now, and what she will decide about the future. So she is a very strong character, full of temperament. EP: Yes, BUT he [Stephen Costello] has high C’s! He has, as he showed us. I’m sure it will be ok, everything. CN: This is actually your third appearance for San Diego Opera, the first of which was a recital several years ago. What draws you to San Diego in particular, given your relatively few appearances in the United States? EP: It’s a little bit too far you know [laughter]! I’m not twenty years old anymore and it’s pretty tiring for me and for my husband to fly two days, almost, 20 hours in the plane with all those virus factories [laughter]! I am always sick after a trip, so I have lots of things to do in Europe. CN: lot has been said and written about how unique your voice is. Do you think the role of the true contralto is something we’ll see more or less of in the coming years? EP: Listen, all my life, I sing only contralto roles because I feel very comfortable in this kind of repertoire. Even the roles written for Mezzo are not good for me, so contralto is a special voice between soprano and alto. I have three voices and I am furious when the critics write that they hear differences between my registers. OF COURSE I have differences between registers because my low register is like a man’s voice and the high register is like a soprano voice. In the middle I am like mezzo, alto. I have more than three octaves. It’s not too easy. It’s almost impossible to make this kind of voice the same from top to bottom. It’s impossible, but all my life I sang roles written for me. I never pushed my voice to do something I don’t feel comfortable with. Once I sang Don Carlos in Philadelphia. I sang the arias from Don Carlos many times, in concert, and they were perfect for me. So I decided to do this whole role [of Eboli] on stage and it is written for Mezzo, but I have no problems with these arias so I thought it would be OK. It wasn’t. Because when I had to sing duets and trios and everything with the stage acting, I realized that I am tired, really tired at the end, and I have to sing “O don fatale,” the most important aria. Of course, I sang this and it wasn’t bad, but I’ve only done this twice. First and last, and I never do this [again] because it’s not for me. I have all those notes, but you know the tessitura...Now, I have this kind of experience. I know what I can sing and I can’t sing. CN: Is it talent, is it the technique, or is it both that make a contralto? EP: You know you have to be born with this kind of voice. You can’t learn this. You can’t. I was born with this voice. My mother, who was a singer, she told me immediately when I started to sing in my first lesson, ”Ewa, you have a very, very rare voice. You have a real contralto voice. It is very rare.” Now it’s a little bit en vogue. Almost every mezzo, alto, they call themselves contraltos, which is not true. Real contralto has to have at least three octaves, flexibility, natural coloratura, this kind of three voices: very low, middle, and very high. So, it’s very rare and, of course, you have to practice your voice, but it makes me a little bit nervous when every alto calls herself a contralto. It’s not true. It’s a big difference between contralto and alto. Alto is short voice without high notes. It’s the same, dark color, low register, but real alto has no flexibility and no high notes. This is the difference between real contraltos and altos. You know, I’m not sure that we have [another] real contralto right now. I’m not sure. CN: What does your future hold and what does that mean for the future of the contralto in opera? EP: Listen, my future as a singer is rather short [laughter]! I started singing in 1975 so I am onstage for a long time. Thank God my voice is not touched and pretty healthy still, but I am not young anymore. I sang Rosina, Cenerentola, now I am ready to sing roles [such as] old witches, you know [laughter]. I can’t sing young men, Tancredi, Arsace, Orfeo, it’s finished for me. But, I discovered another part of the repertoire. This kind of role, La Cieca, Countess, Madame de la Haltière, Marquise de Birkenfeld, Erda, Ulrica, Azucena, beautiful roles, dramatic roles, which I, at the beginning of my career, I avoided. I was asked to sing Azucena thirty years, but I sang only Rossini and I said, “maybe in thirty years...I’ll be able to sing Azucena, but not right now.” It’s been enough time for me that I can sing Azucena without any problems. [I have] the right color, the right tessitura, the experience...the experience in life and also the professional experience. [There are] so many things to do. I can only ask for health, good conditions...OK, we’ll see! CN: You mentioned Erda, that was in Seattle a few years ago? EP: Yes...I will also sing it in Barcelona next year. It is a small role, I am four or five minutes onstage, in Das Rheingold. In Siegfried I am a little bit longer...but it’s so important! [It’s a] secondary role, but you know everybody is waiting for Erda’s appearance! So, I like such a role. You are not getting tired but you can make an impression [laughter]! CN: As you’ve mentioned, you’ve been doing this for over thirty-five years now. What are the technical challenges or changes in your voice that have become harder for you as the years have gone on? EP: Maybe, MAYBE, coloratura. Of course, I still sing it sometimes in concerts, but frankly I’ve had enough coloratura. I’ve sang it all my life [demonstrates] and I’ve had enough. Of course, I’ve had possibilities to do this and everybody asked me to do coloratura because it was fantastic. But I always dreamed about dramatic roles: Azucena, Ulrica...but I couldn’t do them. Now finally I can do them and I am happy! I don’t need coloratura anymore. I leave this for young people, for young singers. Don’t touch this kind of repertoire [Azucena] too early. This is my advice for young singers because the directors, impresarios, agents, if they have someone with a beautiful voice, with talent, they ask them to do everything at the same time. It’s very dangerous for young singers and they...just will destroy their voices if they accept repertoire which is not for them right now. Azucena wasn’t for me thirty years ago. Now, it is perfect. [If I had accepted it] thirty years ago, maybe we wouldn’t be talking today, because I probably wouldn’t have a voice anymore after Azucena. Because you know, with age, the voice changes. After I brought my daughter into this world, my voice changed color. At the beginning my voice was very bright, very clean [demonstrates]. Now it’s very dark, big, and you have to wait, step by step, for everything. It will come. It will come in the repertoire. The repertoire, the music is so beautiful. Every year you can find something really for you. Young singers are afraid to not accept something. For example, the famous conductor Herbert von Karajan destroyed so many voices. He had only beautiful voices around him, very talented people. He pushed them to sing what he wanted them to sing and they were afraid to say, “Please, maestro, don’t. It’s too early for me. Maybe later. I’m not able to.” They were afraid and they accepted to do what he wanted from them. They sang normally one, two, three years, that’s all. Young people should be very clever, very intelligent, and not be afraid to refuse. It is their life. They can refuse right now, but that doesn’t mean they will not have proposals in one year or two years. CN: My first singing teacher told me it’s very important to know what you can sing right now, what you can sing in five years, twenty years, and what you should never sing, and the differences between them. EP: Absolutely. Absolutely. You have to know...In my life, everything came natural. I never sang something not for me. I accepted important roles, important characters. Maybe thanks to my choices I can still sing and be in good shape. My VOICE is in good shape [laughter]. CN: We’re thankful for that! One last question: What is the one role, one composer you have not sung that you are just desperately waiting for someone to ask you to sing? EP: [laughter] I don’t think I have such a composer or a role. I have done everything I have wanted to do. Really. I am happy because of this. [Pauses] Ah, I would like to sing Tosca! [laughter] All my life I wanted to sing Tosca. This music makes me crazy! When I was a child in Poland, I had only record, this black disk, you know, with Maria Callas, and I sang all day when I was listening to this record. It was permanent. It was constant. I know by heart all the roles. I can sing Cavaradossi. I can sing Scarpia! [laughter] It was my dream, but it can’t happen [laughter]. CN: Speaking of Puccini, you sang the Principessa in Suor Angelica? EP: Oh, fantastic! I love it! I love it! I love it! [laughter] I sang this in San Francisco...but I’m waiting for another invitation. Ah! Fantastic personality! I love her! You know, Elektra for example, it’s new for me, Klytaemnestra, I discovered this. I love to sing her. I can tell you, after years on stage, to compare this, I’m sorry to say this, stupid [demonstrates] coloratura in Rossini, baroque music, when you repeat the same text hundreds of times, with Strauss, the Principessa, where every word is important, every note, every phrase...In baroque music, Rossini, most, 90%, is only fireworks, just to show to your technical possibilities. You have no opportunity, you have no chance to show drama, to create something theatrical, something important, authentic dramatically. Of course, you have to be in good shape. You have to show your flexibility, high notes, low notes, technique, technique, technique. Now I have the possibility to show my real talent, what I really want to say, what I have to say onstage. Now I am much more happy than I was before with this new repertoire [laughter]. I have had enough coloratura. People still ask me because I was famous for it, but I don’t want it anymore. Now, I’m too old to sing coloratura. It’s written for young people. Old characters don’t have coloratura. No one wrote coloratura for old characters in opera. I don’t sing coloratura right now, so life is happier, thank God [laughter]!